When seventeen-year-old Stacy looks in the mirror she can see and talk to her future self. “Older Me” has been Stacy's secret support through the ongoing battle with their neurotic mother, relentless bullying at school, and dealing with her hopeless love for her best friend, Mark. Then Stacy discovers Older Me is a liar. Still reeling from that betrayal, Stacy is targeted again by her most persistent tormentor. Only this time, he's used her own artwork to humiliate her - and threaten her last chance with Mark. 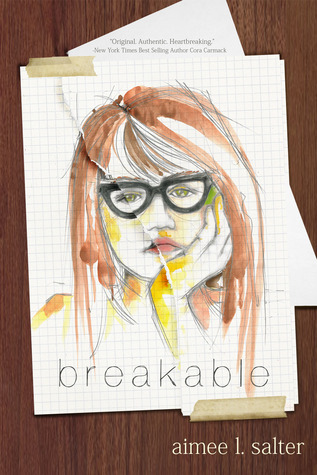 Powerfully written, Aimee L. Salter's debut novel, Breakable, is a must-read Indie book that rivals traditionally published young adult novels. Seventeen-year-old artist Stacy regularly sees an older version of herself, dubbed Older Me, in the mirror. Sounds cool, right? And helpful? Well...maybe not. Stacy's future self is full of warnings--don't go to that party, don't trust that person etc.-- but not so willing to give Stacy answers. Despite the warnings, Stacy makes her own choices and not all of them turn out well. Already the victim of some terrible bullying, not listening to Older Me, proves to make things worse for Stacy. I can't say too much more without giving away any spoilers, so I'll stop there, but I will say this: I don't often read books twice, but Breakable is a book I could definitely see myself picking up again. The writing is lovely and well-paced, and Stacy is a character you can't help but root for. And as a quick, final note, the cover, a self-portrait of Stacy, fits the book perfectly. Check out Breakable. You won't be sorry. And now without further ado, my interview with the super sweet Aimee L. Salter! 1. I read that you got the idea for Breakable from the Dear Teen Me Series. Is there one thing you wish you could tell your teen self? Oh, gosh. So many things! I think if I could tell her one thing, it would be to trust her instincts and to use them when she's making decisions. 2. What is your writing process like? Are you a planner or a pantser? The very first book I wrote I pantsed and I lost so much time to going back and rewriting where I'd gotten sidetracked or off point, that I swore I'd never do it again. Since then I've outlined every manuscript I've started, even the ones I haven't finished. And I love it that way. That said, I tend to “pants” scenes quite a bit. I usually know going into the scene what I need it to achieve, but I don’t generally know how I’m going to do get the characters from A to B. So I enjoy the ride, from that perspective. 3. Could you talk a little bit about the journey your book has taken from first draft to now? Why did you choose to self-publish? Wow, it sure has been a journey! I started writing Breakable (then called Listen to Me) in February 2011 with no intention of trying to get it published. But since then I’ve had two agents (for two different books). I’ve been on submission to Big Six editors twice, and both times had great responses to the manuscript, followed by consistent feedback for revisions. And in both cases, while we were in the middle of those revisions, both agents had to leave our contract for personal reasons (and no, that isn’t a euphemism). Lucky for me, the second agent (Brittany Howard – aka NYT and international bestselling author, Cora Carmack) believed in Breakable so much, she offered to do anything she could to help me “get it out there”. She would have helped me find another agent. 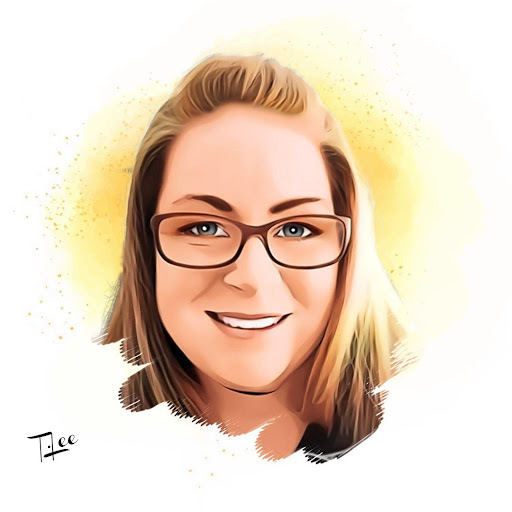 But I think I was discouraged by the idea of trying that entire process again, with no guarantee that, even if I could find one, we wouldn’t have yet another year of revisions ahead of us before we got a contract. On top of that, Brittany/Cora’s career started with a self-published novel. She knew what was involved. She knew what I would need to do to give my book any chance of success. And she was in a position to help (she’s blurbed my book for me and helped me promote it, which is REALLY generous of her). So, after about three weeks of vacillating, I decided to take the plunge. And honestly, I haven’t regretted it for a second since. Don’t get me wrong – there’s a lot of nerves involved in this process. I’m terrified of fading into obscurity like so many other debut, self-published authors. But at the same time, I’ve had the chance to put the book out exactly how I want to. I don’t answer to anyone. All the decisions have been mine. All the design aspects were approved by me. I did the formatting myself, and I wrote all the promotional material. Of course, that means that if Breakable isn’t a commercial success, there’s no one to blame but me! But honestly, even if it doesn’t sell a ton of copies, I’ll be honest: I feel like I’ve achieved what I always wanted to achieve with this book. And I did it myself. It’s a great feeling. Even knowing the risks, I don’t regret it a bit. 4. What is the most important thing authors should know before deciding to self-publish? No one is kidding when they say it’s a TON of work. No one. Not kidding. A TON. The author who enters self-publishing because of impatience, or an unwillingness to let others speak into their work is likely to get hurt. If you decide to do this, make sure you’re making what is it at least an arguably valid business decision. Don’t spend more than you can afford to lose, don’t expect the internet to overload Amazon looking for you just because you’re there, and don’t step forward before you’ve learned how to gird your loins. When you’re the brain behind (almost) every idea, the hand behind every keystroke, and the inspiration behind the vehicle, inevitably you’re travelling alone. No matter how many people support you, love you, and love your book, in the end, it’s all up to you. That can be a very isolating feeling. And if something fails, it can be foundation-shaking. I think you have to be a very strong person (or perhaps a stupid one? Ask me in a year) to self-publish. You have to be able to get up when you’ve been knocked down, stand up when someone tells you you’re wrong, and keep going when it feels like every force in nature (or on the internet) is working against you. You have to be happy with your own company. And you have to be willing to fail. 5. What do you see as the benefits to self-publishing? 6. Was there a part of your book, maybe a particular scene that was your favorite to write? Why? Hmmm…yes. The first time Stacy got kissed by Mark. I lived that moment with her. It was awesome. And, forgive me, a little bit hot. Scenes like that are fun to revise too, but there’s nothing like the first time you inhabit that moment and find the words to describe it. It’s one of the best parts of being a writer. 7. I've read your blog posts about writing. They're great! Could you select a couple of your best tips/tricks of the trade to help aspiring writers? Thank you! It’s so cool to hear from people who’ve read my blog and found it useful. You can’t grow as a writer if you won’t let other people in to read your work and criticize it. Yes, it’s hard, but it’s a necessary part of maturing your skill. And there’s a really healthy by-product I hadn’t identified until recently: Having people critique your work and tell you what’s wrong with it prepares you for the process of being reviewed. Because it’s impossible to write the book everyone wants to read. So negative feedback and reviews are inevitable, no matter how your book is published. Learning to deal with that in a healthy way is really helpful when it comes time to facing the masses. Whether you’re a Planner or a Pantser, I really think understanding and being able to anticipate the key turning points of plot and structure makes you a better writer. I’ve a got a plot development series on my blog [link: http://www.aimeelsalter.com/p/plot-development-tips.html] that touches on some of the key elements, but there’s SO MUCH material out there from better, more experienced writers than me. Learn the craft. I can’t stress that strongly enough. Learn from others and see what a difference it makes. (If you’re not sure, start with Dwight V. Swain’s Techniques of the Selling Writer. It’s 40 years old and written differently than we expect these days, but that book is GOLD for the writer who wants to truly understand how fiction works and how to make a story work for you). 8. Lastly, what's up next? Are you working on a sophomore novel? I’m working on about five! (Nope. Not joking). Because I struggle to know which one should get my full attention, I’m offering readers a chance to win a character named after them. All they have to do is read three brief book descriptions, then tick the box on how much each concept appeals / doesn’t appeal. Thanks for having me, Beth! Your support is awesome. And this has been a fun interview! Aimee L. Salter is a Pacific North-Westerner who spent much of her young (and not-so-young) life in New Zealand. After picking up a Kiwi husband and son, she’s recently returned to Oregon. She writes novels for teens and the occasional adult who, like herself, are still in touch with their inner-high schooler. Aimee is the author behind Seeking the Write Life, a popular blog for writers at www.aimeelsalter.com. You can also find her on Twitter (www.twitter.com/@AimeeLSalter) and Facebook (www.facebook.com/AimeeLSalter). Bronze! Podium Finish Debuted at Number 3!